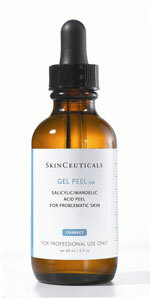 Launched in the UK in October 2004, SkinCeuticals Gel Peels are an excellent adjunct to microdermabrasion or IPL; and are ideal for those people who want to `prep` their skin prior to a more invasive peel. As they are a light peel they also have no down-time. They freshen up the face and can help to treat acne, break down hyperpigmentation (areas of darker pigment or brown patches in the skin), dry skin, fine lines and wrinkles, photodamage, rough texture and ageing skin. Not applicable as it is a superficial peel. Trained members of the medical profession only and beauty therapists (NVQ3 level and above) who have received training by Skinceuticals. Contains glycolic and lactic acids and is used for photo-damaged skin. Contains salicylic and mandelic acids and is used for problematic skin, such as acne. Pregnant, breastfeeding women or those already on a peeling programme, or using retinol products. 2 weeks prior to the peel, a patch test is carried out and you will start using Skinceuticals C+AHA Antioxidant Serum morning OR night-time. It is recommended that a course of 6 peels (1 per week) is undertaken. Thereafter, once a month for maintenance is ideal. Those going on a course of Skinceuticals peels should also be using a topical antioxidant serum containing AHAs (fruit acids) and a broad-spectrum sunscreen to get the full benefits of the peel. Alternatively, you can use one of the AHA products within the range – i.e. Intense Line Defense. As the peel is a correcting procedure you will need to use products which will prevent the new healthy skin cells being exposed to sun damage, which can counteract the benefit of the peel and result in future photo-damage problems. According to the manufacturer there are no reported side effects apart from initial mild redness and peeling that may occur following treatment. This depends on area treated and how much is required, and the practitioner doing the treatment, but ranges are in the region of £50.00 to £80.00 per treatment session. Photographs above courtesy of Skinceuticals Ltd.
Click for ALL Skinceuticals Gel Peel clinics in the UK & Ireland registered and verified by Consulting Room.